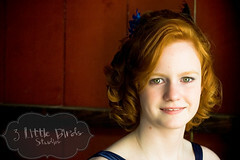 3 Little Birds Studios: Doing it Prom Style! M & A were great sports this evening! We had a few last minute location changes, and were battling the elements, but they were troopers. The shoot went well, and we got some really great pictures! Seeing such lovely young women makes me feel OLD though! Anyway, they rocked the beautiful dresses and their hair was totally awesome too! I hope I did it justice! Enjoy!